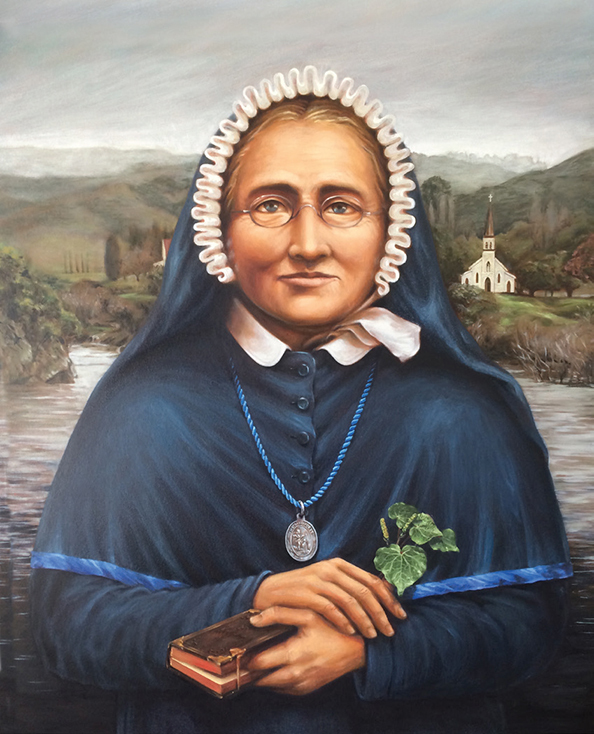 Venerable Suzanne Aubert – Meri Hōhepa. The founder of New Zealand’s Sisters of Compassion, Suzanne Aubert, has been declared ‘venerable’ by the Catholic Church. The declaration by Pope Francis, announced early last December, is a major milestone on the path to sainthood being bestowed on Aubert, who came to New Zealand from France in 1860 and died here aged 91 in 1926. If Suzanne Aubert’s Cause for Sainthood is successful, she will be New Zealand’s first saint, said Cardinal John Dew. ‘She was a remarkable woman who devoted her life to helping others. She was a pioneer of New Zealand’s health and welfare system and a friend to Māori throughout her life. Her tireless compassion and practical brand of Christianity made a huge impact on New Zealand society. Being declared ‘venerable’ is a major step towards sainthood in the Catholic Church, said Dr Maurice Carmody, the Roman promoter of her canonisation cause. ‘There are a number of stages in the canonisation process. Last year the official case for her proposed canonisation was submitted to the Congregation for the Cause of Saints in Rome. Her case has been examined by Church historians and theologians and now, with the Pope’s approval, she has been declared “venerable” – the second stage on the way to being declared a saint. Dr Carmody (parish priest at St Theresa’s Parish Plimmerton) said although Aubert died in 1926, her beliefs and work were still relevant today, especially in the areas of child protection and cultural understanding. The Sisters of Compassion’s congregational leader Sr Margaret Anne Mills said it was very exciting for the order. ‘Declaring her venerable affirms this woman’s life, both in what she did, her faith, her values and her legacy in what she’s left behind. Her legacy is the work still undertaken by the Daughters of Our Lady of Compassion today. The sisters provide many charitable services, including running the soup kitchen in central Wellington. They are engaged in social work, pastoral care, prison and hospital chaplaincies, education, working with disadvantaged migrant communities, and care of the sick and the elderly. Sr Margaret Anne said the declaration of her venerability has enormous significance for the Sisters of Compassion, the Catholic Church and New Zealand. ‘It affirms the work of so many people who have maintained and prepared her writings for the theological and historical commissions in Rome. ‘On the announcement there was a swell of joy among the sisters, community and many others throughout New Zealand, the Pacific and Australia, and messages of affirmation from France. On 25 January, the remains of the Venerable Mary Joseph Aubert (Suzanne) were transferred from her grave in the grounds of Our Lady of Compassion at Island Bay to a crypt in a side chapel of the congregation’s main chapel. An official opening of the new crypt will take place later this year.